Thank you to all our parents and families who came to support their children at Sports Day this year! It was another great morning enjoyed by everyone, especially the Green Team who won overall!! We hope you all enjoyed the snow and after the unexpected break are back and ready to do some amazing learning. Parents Evening and World Book Day are being rescheduled due to the Snow Days and we will keep you informed of when these will be via Twitter and Text Message. Castle Wood Academy will be CLOSED on Friday 2nd March. Due to the continued severe weather conditions Castle Wood will remain closed tomorrow. Please keep safe and warm. Have a lovely weekend and we will keep you up-to-date over twitter, text message and the website. Payments for bookings on Wednesday 28th February, Thursday 1st March and Friday 2nd March will be credited to accounts on Monday. Any queries relating to Acorns bookings should be emailed to enquiries@talloaksacademy.co.uk. Mr Brown has just informed staff that Castle Wood will be closed again tomorrow (Thursday 1st March). We will keep you updated if we will be opening Friday. We have loved seeing all your pictures on Twitter of you having fun in the snow! Due to the snow, Castle Wood Academy is closed today (28th February 2018). We will keep you updated on what is happening for the rest of the week via twitter, text message and the website. Each year, the number of parents selecting Castle Wood Academy as the first choice place for their child is far greater than the number of places available. This is because we can offer pupils a very good standard of learning and the opportunity to achieve in a stimulating environment. We believe that the expansion would benefit Castle Wood in many ways; the school would become an even more important part of the local community and expanding the building would will provide better facilities and education. Please feel free to read about this exciting time in more detail by clicking the letter below! 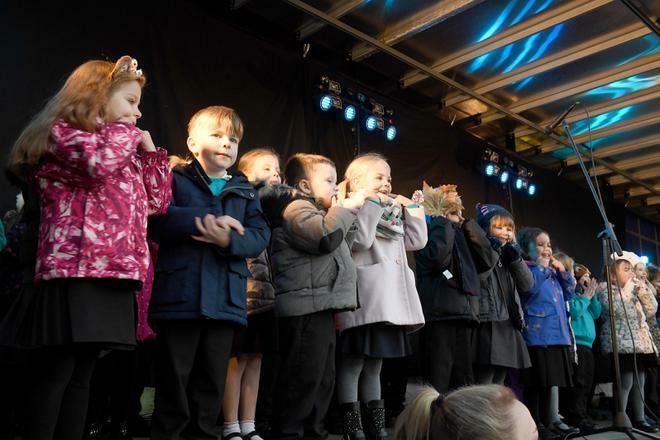 We had a wonderful morning at Castle Wood Academy on 30th January. Parents were invited into school to spend some time in their child's class, see what they got up to and read with them. There was a wonderful turn-out and the children loved showing their parents all the great learning they do! The Reading Morning was to promote our Twitter campaign of #storytimeselfie in support of @DSATLiteracy. Please check out our twitter page @CastleWood_ to see our staff and children enjoying a good read! Welcome back to all our children and parents. We hope you all had a wonderful Christmas break and are ready for 2018. The term has started off brilliantly and all the children look so grown up! We have lots of exciting things happening this term at Castle Wood, starting with the arrival of our chicks on Monday 15th January. Keep looking out for pictures and updates of our fluffy friends! Our fortnightly newsletter went out yesterday with all the important dates for you to note in your diary. It is also available on the website in 'Communication, Newsletters'. On Friday 15 December we are taking part in Save the Children’s Christmas Jumper Day. The whole school will be taking part and going full-on festive in our TinselKnits and JollyJingleJumpers for the day. All your child needs to do is wear a festive woolly and bring in a suggested £1 donation. There’s no need to splash out on snazzy new sweaters to join in the fun you could borrow or bling up an old woolly with a few decorations. If your child doesn’t have a Christmas Jumper, don’t worry! We’ll be turning old sweaters into sparkly new creations in Christmas craft sessions at school so all your child needs to do is bring in an old unwanted jumper (plus a few decorations if you have them to spare) and a donation. We’d really appreciate your support to make Christmas Jumper Day a success – it’s a great cause, so together, we can make the world better in sweaters! When adverse weather conditions are being experienced, that is when ice and snow are on the ground, all children and adults who come on to the school site are requested to only use the treated footways. We would also strongly advise parents not to use our driveway, particularly at the beginning of the school day. If you do not bring your child to school, please could you make your child aware of this instruction. Your continued support in keeping our school site safe is very much appreciated. We will always endeavor to notify parents at the earliest opportunity to enable them to make alternative childcare arrangements if necessary. 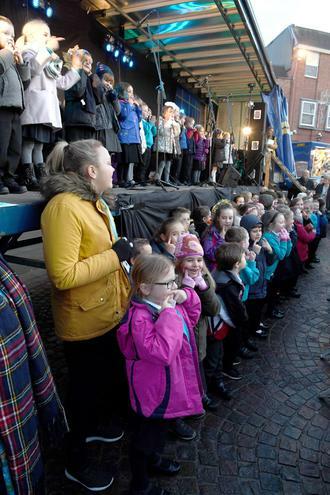 An amazing well done to all the children who took part in singing at the Christmas Lights Switch On! A big thank you to parents for coming down and supporting your child and their friends. The staff absolutely loved it and were so proud at how brave and well behaved all the children were! We hope it got you into the festive spirit. They are full of fun things we have been doing in class and in school. If you wish to follow our class pages please do be advised that we will need your twitter username so we know who you are ! 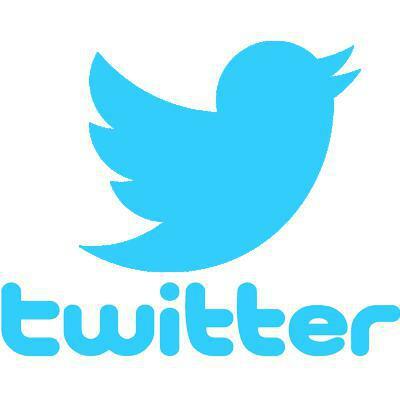 Our school twitter page is public so we can reach a wider community. If you have any problems with any photos or wish to contact us regarding any concerns you have please do not hesitate to do so! Castle Wood is marking Anti - Bullying week this year. From Monday 13th November for one week the class with be taking part in activities and talking about bullying. If you have any concerns, questions or issues you would like to be raised please do speak to Mr Brown, Mrs Taylor, or contact the school office. 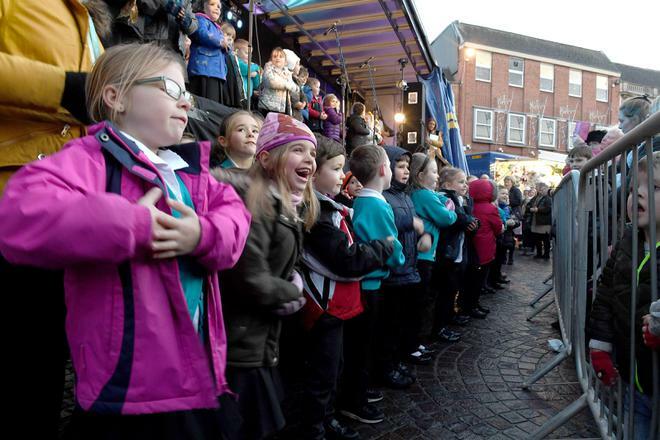 Gainsborough Christmas Lights Switch On! 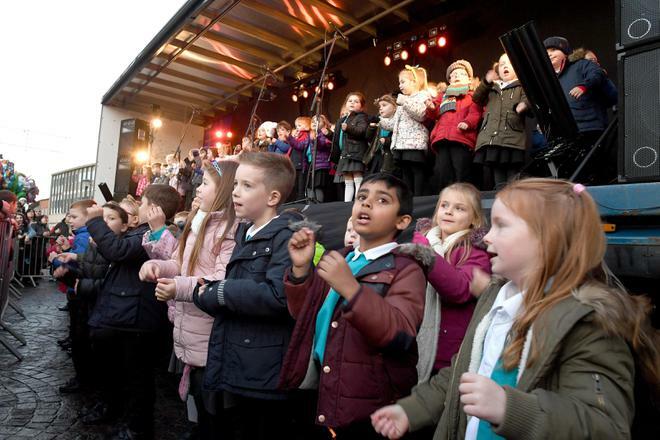 Miss Payne has arranged for Castle Wood Academy to sing in the Town Square during the Christmas Lights Switch On on the 17th November. 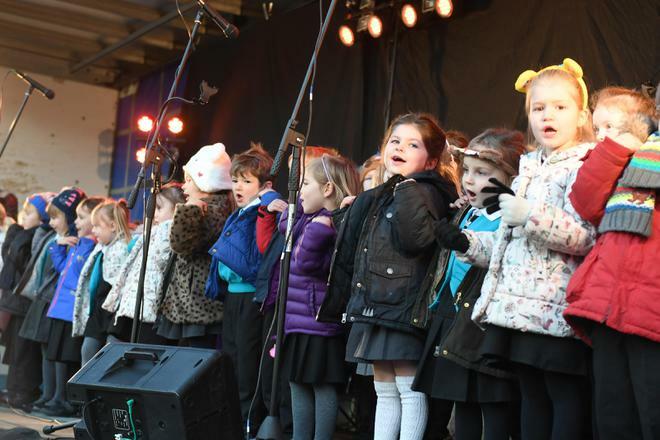 Children will be going on stage at 4 pm and will be singing two Christmassy songs for all to enjoy! Tell brothers, sisters, grandparents, aunties and uncles to come down and support us! It will be a magical evening. If you wish your child to attend please go to our "Communication" page and download the permission slip. We have appointed a new Head of School! We are delighted to inform you that Mr Gary Brown has been appointed Head of School at Castle Wood Academy. Mr Brown has moved from Leicester, where he worked in an inner city school, to live and now work locally in Gainsborough. Doubly lucky for us is that he can start on the 16th October. When offered the position he commented that he was very excited about the prospect of developing Castle Wood in to an outstanding primary school at the heart of the community. I am sure that you will join us and the children in congratulating him and welcoming him in to our community. Castle Wood Academy is working alongside The Salvation Army to help save the planet, raise money for the school and raise money for charity. The scheme is called "Recycle with Michael" and involves donating any unwanted clothes and shoes. Further details will be sent to parents as to when they can expect their "Recycle with Michael" bag. We are very pleased to announce that our new pathway is now completed and ready for use. Access to Castle Wood will now only be possible via the new path which runs alongside the driveway. Thank you in your assistance in keeping our school site a safe place for our children. Have a look at the path below. Click on the picture for a closer look! During visits parents and children will have the opportunity to look around our school and meet with key staff. If these dates are not convenient, please contact Miss Wilson, Receptionist and she will be pleased to make alternative arrangements for you to visit. Please contact Miss Wilson on 01427 811516 or email enquiries@talloaksacademy.co.uk. Welcome back to our Year 1 and Year 2 Classes and a big welcome to our Reception Class! Everyone has settled in lovely and we are ready for a brand new academic year full of amazing learning! Check back here regularly for any updates. Polite reminder: Please do not use the staff car park when dropping off or collecting children. Building works are still continuing in this area. Please feel free to contact school if you have any questions or require further information. The Government Regulations changed in September 2013 which meant that educational establishments could no longer authorise absence for holidays. However, you can request an absence for exceptional circumstances. If you do need to make a request to take your child out of school during term time for exceptional circumstances, please visit the school office and collect the relevant form. Please note: Tall Oaks Academy Trust retains powers to fine parents who take their child out of school without permission in conjunction with the Local Authority. Annual family holidays are NOT considered exceptional circumstances. Our Newsletters are produced termly and one copy sent home with children. Copies of the Newsletter can also be downloaded from this website. If you would like to see anything different in the newsletters, please let us know. Details of our after-school clubs are now on this website. If your child didn't bring home a letter about clubs and you would like to see if there any spaces left in a specific club, let us know.